Social Justice and Ecology Secretariat (SJES) commemorates its Fiftieth year in 2019 as announced by Fr. General. We is grateful to Elías López, SJ for helping to design the logo with the assistance of Comillas University, Madrid. Logo Explanation: The Cross in the middle of the red circle reflects the faith that is at the heart of our journey of Justice (J) and Reconciliation (R) over the last 50 years. The uneven line below J & R symbolises our journey. 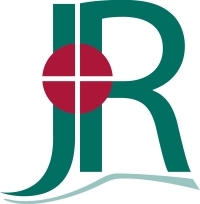 The red around the Cross reflects the sacrifice and suffering resulting from our choice, while J & R in green shows the importance of promoting life, renewal and energy.